In the context of the second project led by our colleague, Dr. Julian Garcia, to disseminate and disseminate science among children in elementary schools, the following event takes place. 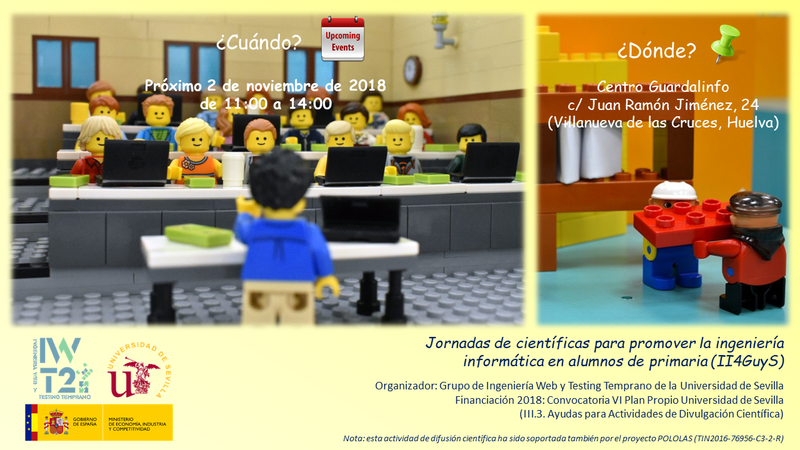 The project is entitled “Jornadas de científicas para promover la ingeniería informática en alumnos de primaria (II4GuyS)” and the event will try to use the techniques of the Lego Serius game to instill computer knowledge and tolerance values ​​for children in primary and secondary schools. These seminars have been funded by VI Own Plan US III.3. HELP FOR SCIENTIFIC DISCLOSURE ACTIVITIES (VIPPIT-2018-III.3). This event will be taught by researchers of the University of Seville project and will take place on November 2, 2018 from 11:00 a.m. to 2:00 p.m. in the Guadalinfo Center, Juan Ramón Jiménez Street, 24 (Villanueva de las Cruces). From here we appreciate the collaboration of the municipality of this municipality of Huelva. If you wish to participate in the event, send us a request by email to the attention of María José Escalona (mjescalona@us.es) or Julian García (juliangg@us.es).